Description: The Physical map of Montana showing major geographical features such as rivers, lakes, topography and land formations. 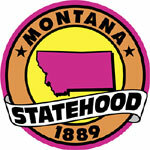 Montana is the 4th largest state in the country of the United States of America. It covers an area of 380838 square kilometers. It is the largest landlocked state in the country. The state lies between north latitude 49 degrees and west longitude 116.2 degrees. The state is nearly 600 miles wide and 321 miles long. The state lies near the northwestern edge of the continent. The highest peak in the state is known as Granite Peak as it rests 12799 feet above sea level. The lowest point however rests on the Kootenai River measuring in at 1800 feet above sea level. The mean elevation of the state measures in at 3400 feet above sea level. The major rivers in the state are the Missouri, Clark Fork and Yellowstone Rivers. The major lakes are Fort Peck and Flathead Lakes. The state has two main ecological zones. The most part is taken up by the Great Plains whereas the rest is occupied by the Rocky Mountain Range. The plains are a wide stretch of land which run across the state. These are full of wide river valleys and scattered hills. The Rocky Mountain Range is covered with flat and long grass plains with flanking mountains. Counties and Road map and map image of Montana.